More than 30 years after taking on the role of British comics’ Man at the Crossroads, Paul Gravett remains at the center of the global comics scene. We had an in-depth conversation about the growth of comics as an art form, the surprise of seeing local manga in Algeria, why he considers himself less of a comics historian or curator than a comics activist, how it feels to have been the first publisher of some of the finest cartoonists of our time, and why he should be called Paul “Mission To Explain” Gravett. Give it a listen! 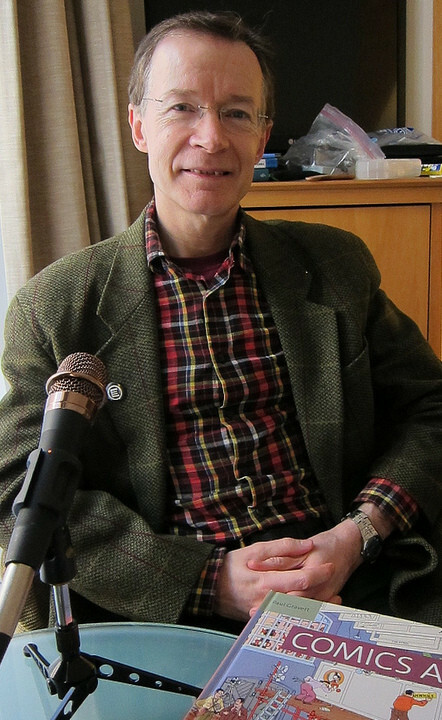 Paul Gravett is a London-based freelance journalist, curator, lecturer, writer and broadcaster, who has worked in comics publishing and promotion since 1981. Under the Escape Publishing imprint, he co-published Violent Cases in 1987, the first collaboration between Neil Gaiman and Dave McKean, three volumes of Eddie Campbell’s Alec between 1984 and 1986, and London’s Dark in 1988 by James Robinson and Paul Johnson. Since 2003, Paul has been the director of Comica, the London International Comics Festival. His very extensive bio can be found at his website. Credits: This episode’s music is The Boy With the Jigsaw Puzzle Fingers by Karl Hyde. The conversation was recorded at the Hilton London Euston on a pair of Blue enCORE 200 microphones feeding into a Zoom H4n recorder . The intro and outro were recorded on Blue Yeti USB Microphone . Processing was done in Audacity and Garage Band. Photo of Paul Gravett by me.